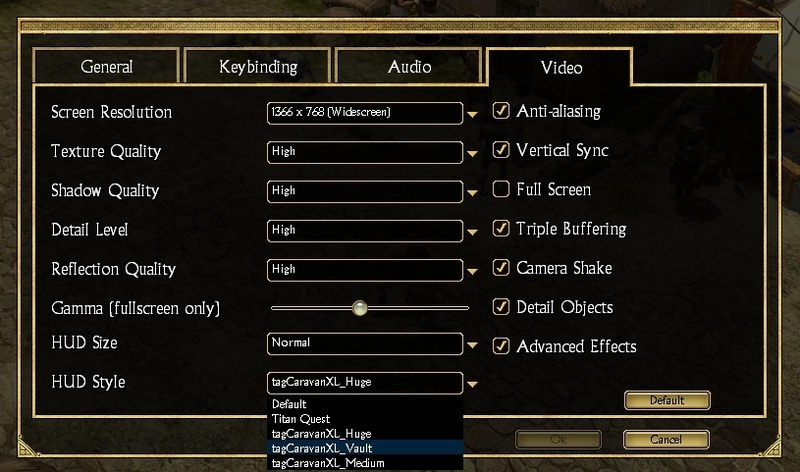 The settings are customized for better movie-like experience. See the ReadMe for more info. Unpack it in your Database folder to remove the occational map markers. Another thing - sometimes you can't exit caves and tomb entrances from inside-out, you have to rotate the camera first. - Fixed mesh/texture mismatch of vanilla "male_002" NPCs in Megara, Delphi and Corinth. - Nature Mastery wolves are of racial profile "Beast" instead of "Animal". - Tweaked all female PC skins and added new bumpmaps to them. They can be used with both skirted mesh and the skirtless mesh from AllSkins, without bump glitches. - Both merchants in Delphi sell new outfits (only female for now, male versions are not ready yet). - Magical affixes are made of common rarity without exception. They show yellow as normal, but can be filtered. - Most "normal" common items remain of broken rarity, and can be filtered as such, but will show white as in vanilla. - The only difference is that some rare items will be yellow + green. This problem is only cosmetic, they show as rare in the filter. - Health and Energy potions have different text colors and show the amount of HP/EP restored. - Changed some property description tags to help new players understand them better. - Most interactable objects (chests, doors, portals, etc.) have khaki (light yellow) color. - Changed names of some damage types to shorter ones: Frostburn DoT = Chill DoT, Electrical Burn DoT = Shock DoT, Vitality Decay DoT = Decay DoT, Slow Physical DoT = Trauma DoT, Instant Poison Damage = Venom Damage. This will be used for sure in my main mod, tell me if you like it here. It's happening in many items (most of these errors in the prefixes) in all of their types, Common, Rare, the yellow green items, the yellow items and in green items. I believe there is connection with the changes you did on the colors of the items. If you don't mind, could you look into it? It would improve the experience with your mod. OBS: Even with this minor inconveniences, my Runesmith is already on the middle of the Act V in the Normal Difficulty. Thanks for your mod sir. Thanks for reporting it. I'll try focus on the mod as soon as possible. Today I started the long delayed work on Enhanced Gameplay V2. The mod will be recompiled from scratch. You will no longer need to replace or put anything in the Database folder to play from the main game. Most of the mod resources will be in a simple ARC file called EG.arc. You'll just need to put it in your Resources folder and thats it. 2. Improved pet visuals - Not much to say here. Summoning the same wolves from lvl 1 to 20 is boring. Pets will look better and change appearance on higher levels. 4. New crafting system - The plan is all NPCs that craft items for you to be removed. Why? Because YOU will be crafting your own stuff! This idea will take a long time to complete, because alot of new recipes, quest skills and interactable decorations must be added. But if it works as intended, the crafting system will be on a whole new level, with mining, harvesting herbs, tanning, blacksmithing... like in any modern MMORPG. 5. Interactable environment - I always loved how many things in Bumbleguppy's mod are interactable. You click on a spear rack - spear drops. You search a bonepile - spiders appear I plan to make something like that as well. 6. There will be other features, these a re just which first come to my mind. Can't wait to try this, but we are patient here. As usual, take your time, don't rush anything. Good luck, it will be a great improvement. Only the biggest one is imported for now. I hope there aren't any complications with unlocking, otherwise it works fine. So cool, I need one for IT. Yeah! Just hope the Caravan and Vault match better when you are done. Ready to try it again. Keep up the good work. TQ Ragnarok on Menu_RisingStorm.2 days I can not understand.I would appreciate that. Tell me if something doesn't work right. This time there will be an IT version, I promise. All 3 different caravans and 3 inventories are imported and selectable through HUD options. Starting to import something else. Sadly, the inventory size parameters are hardcoded in the game engine and cannot be adjusted by unlocking. So there are 3 separate versions in the pack. All versions include 3 separate caravans/inventories in the HUD options, but inventory grids will act differently for each one. I assume that only the "vault" version will show properly. It's the smallest one, but it should work. Test them and tell me if it doesn't. 1. Go to "My Games / Titan Quest - Immortal Throne / SaveData / Sys / *your chosen mod* (say allcaravans_huge)" directory. 2. Delete winsys.dxb and winsys.dxg (If you peviously had any items in that mod's Shared Stash, they will be deleted). 1. Go to "My Games / Titan Quest - Immortal Throne / SaveData / User / *character name (from that mod)*" directory. 2. Delete winsys.dxb and winsys.dxg (It will erase any items that you have left in that character's Personal Stash).